The United Kingdom published its first set of dietary guidelines in 1994, and they have been regularly updated since then. The national food guide, then known as ‘The Balance of Good Health’, was launched in 1994. It was revised and named ‘The eatwell plate’ in 2007. The most recent model, the Eatwell Guide, was published in March 2016. 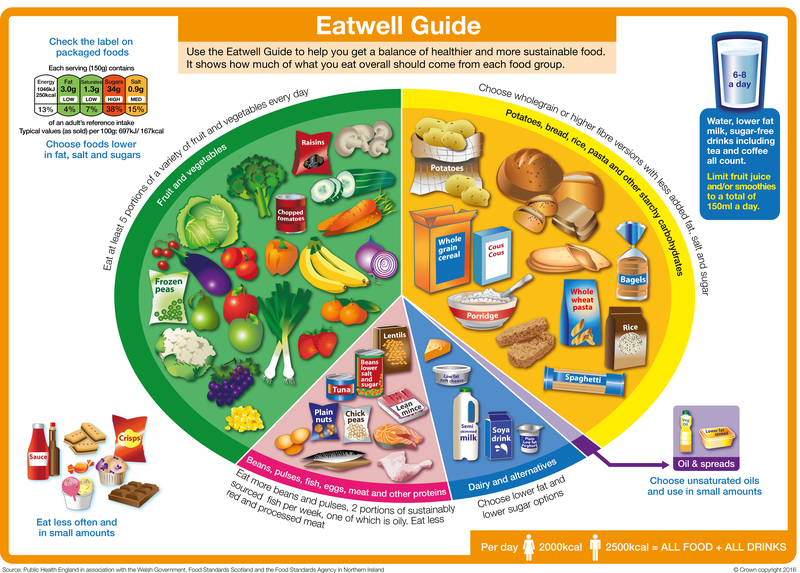 The revision of the eatwell plate to the Eatwell Guide in 2016 was led by Public Health England. The Eatwell Guide has been accepted across government departments and by Food Standards Scotland, the Welsh Government and by the Food Standards Agency in Northern Ireland. The Eatwell Guide is the key nutrition policy tool for health professionals and others working to improve dietary health. It is supported by the 8 tips for eating well. The guidelines are directed at the general population from the age of 2 years. Between the ages of 2 and 5 years, children should start moving towards the diet depicted in the Eatwell Guide. The UK’s national food guide, the Eatwell Guide, is a visual representation of how different foods contribute towards a varied and nutritious diet. It is based on 5 food groups and shows the proportion that each food group should contribute to a healthy balanced diet. The Eatwell Guide: how does it differ to the eatwell plate and why?